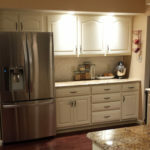 Many people are choosing to refresh their kitchen and bathrooms by painting their cabinets. At Fine Touch Painting, we utilize specialized equipment to achieve a factory smooth, painted finish. Save money, and get a brand new look! 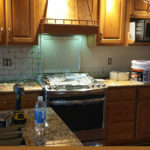 (Before and After) These oak kitchen cabinets were completely transformed for a fraction of the cost of replacement.